We can help you create that perfect showroom kitchen or bath you have always wanted, or add unique one-of-a-kind features to your commercial projects. We engrave stone, wood, metal, glass and more; with custom touches that are uniquely yours. We work with you and your design and construction teams to create distinct and eye-catching pieces, big or small. 100% satisfaction guaranteed. Stu Mann at Etchex is your absolute "go to" guy for any kind of professional engraving on almost any hard surface. At Etchex you will find work of the highest quality on all projects large and small. Etchex prices are very reasonable and everything is completed in a beautiful and timely way. Atriks wanted to “Make an Impression” when people enter their front lobby. 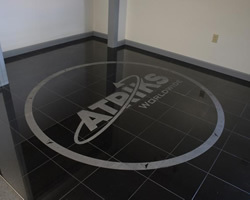 We were able to etch their logo on their entry floor using 12”x12” polished granite tiles. As you can see the results are spectacular! 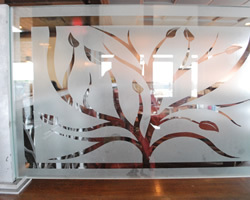 When the Dinnerhorn Restaurant was updating their interior design, they contacted Etchex looking for decorative glass etching to resemble the wrought iron dividers between dining tables. 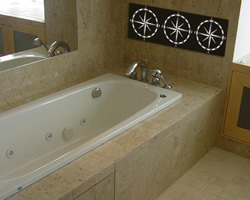 Etchex sourced and engraved 5 glass panels (40"x24") to match their interior design. 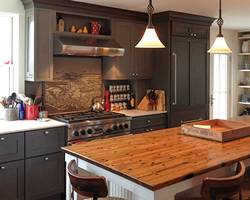 A Wolfeboro designer contacted Etchex with a unique idea - her customer had an antique 1800’s map of Wolfeboro, that she wanted etched as her backsplash for her kitchen remodel. Her house was actually on that old map! The 1” thick slate was custom ordered from Maine. Custom designed for a client in York, Maine, these 6"x6" black marble tiles rendered a very high and beautiful contrast.